If you are like me, time is of essence and storing and searching for counseling materials needs to efficient, quick and easy. Any time searching for something is lost time, so materials need to be ready to go at all times. 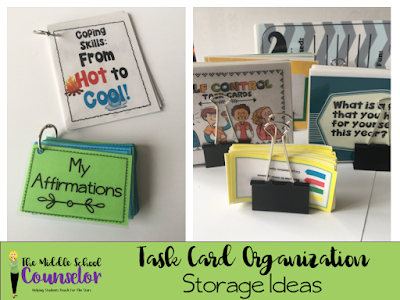 I'll show you some of my favorite storage ideas in just a few. 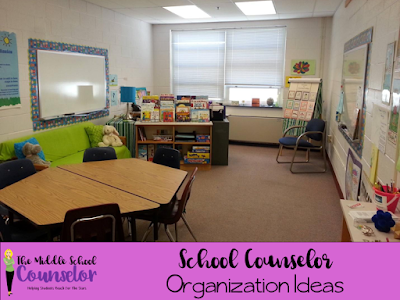 First, I'd like to show some ideas from an elementary and high school counselor because their needs are a bit different than mine. And, many of you are extraordinarily creative in your storage solutions! Holly, a friend who transitioned from elementary school counseling to high school, was an excellent resource for me to pick her brain. When talking about storage solutions, so many elements of storage came up. 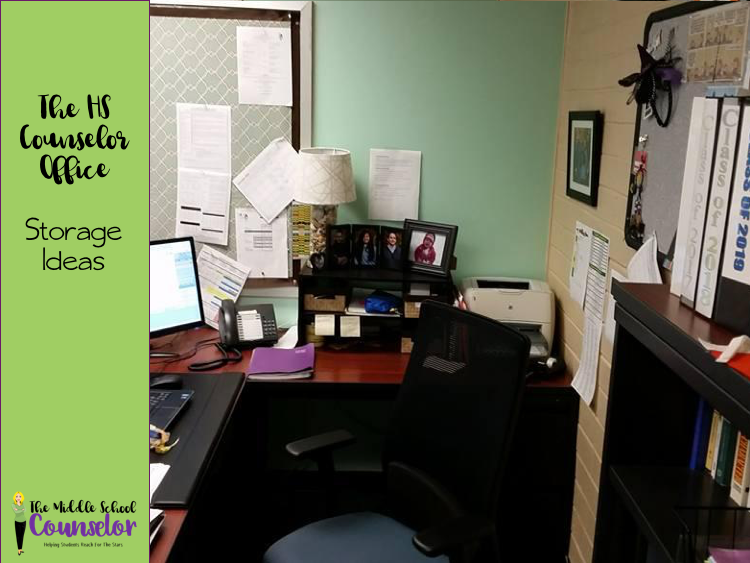 How can you store supplies around your desk? 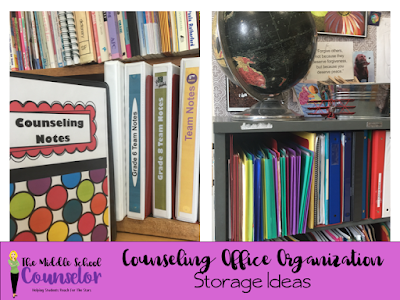 Where do you put stress relief toys, pens, post it notes, 3x5 cards, markers, coloring pages, etc. without your desk looking like a jumbled mess? 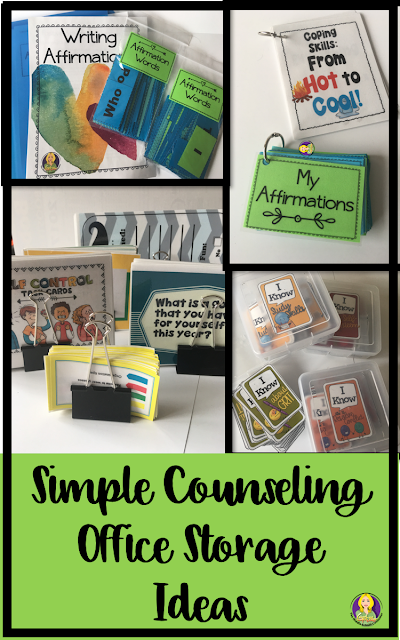 If you are a counselor who uses books for bibliotherapy, and lessons, where do you put them so they are easy to see, and access? 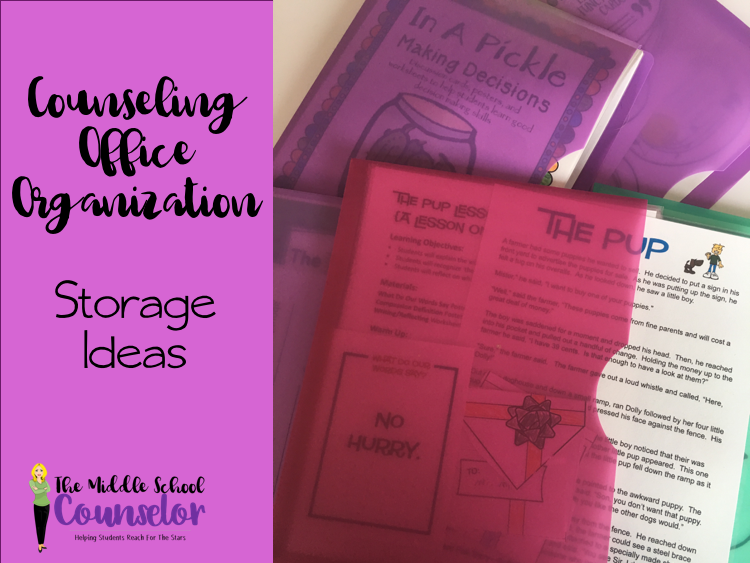 If you run lunch bunches and small groups in your office, how do you separate your work space, which could have confidential information ‘out,’ delineated from your meeting space? Holly also uses a short, wide bookcase for game storage, and a place for bins of coloring and writing tools. She is very lucky to have such a large space. Moving on to High School, this is Tracy’s office. Tracy is a high school counselor, and has less of a need for bin storage, but needs organized storage for student files and lessons. Tracy stores many lessons on her hard drive, but keeps hard copies of worksheets that accompany lessons. She had a need for storage on her desk to keep it neat. 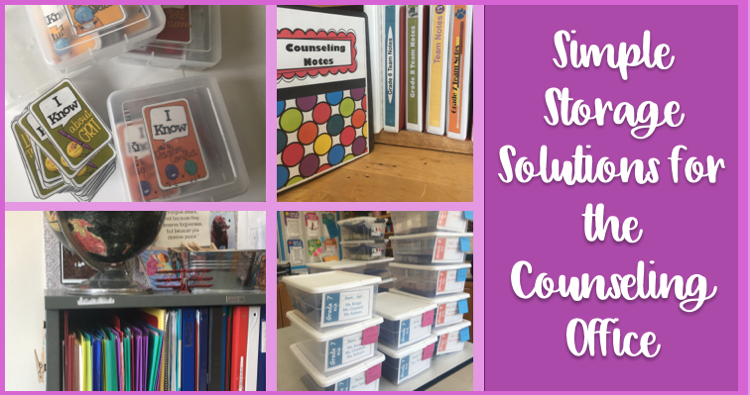 Post it, tabs, highlighters, colored flair pens are staples for course selection, colored pencils and coloring sheets come in handy with stressed teens, as are small toys to keep one’s hands busy, and help students calm themselves. 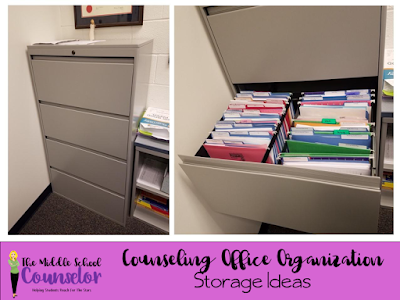 Tracy’s favorite storage solutions are her 4 drawer hanging file cabinet, small desk shelf, and her basket of toys. Tracy’s office has transitioned from very large, to quite small, and she likes an ‘L’ shaped desk to remove paperwork from others’ eyes. But because I do more that State Testing, I also need storage for all the other things I do each day. . . counseling, lessons, meetings and groups. Here are some things that help me. I use binders to keep track of all my meeting notes. I use one for each grade level team, my counseling notes, 504 Caseloads, and our mental health team notes, as well as our Student Support Team referrals. I have two large bookcases in my room, and every shelf is full. 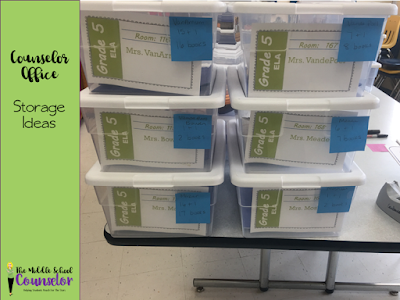 The plastic accordion folders in the photos below, show how I organize all my lesson plans. 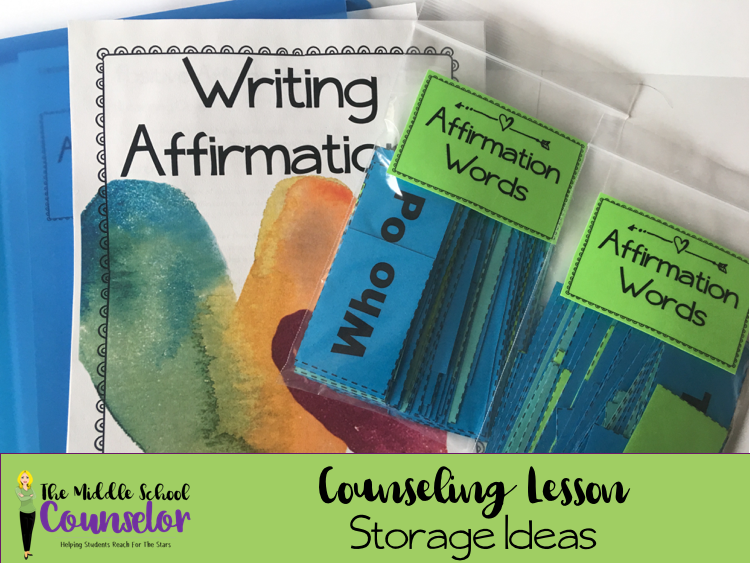 Each plan goes in it's own folder and those lessons with pieces, like the Writing Affirmation lesson, get labeled in zip lock baggies I steal from the nurse. 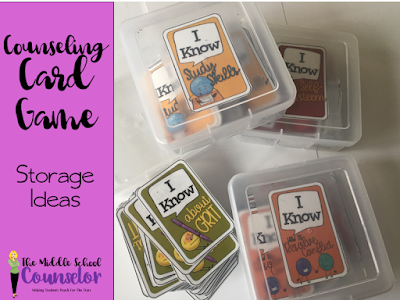 Things kids use all the time get stored on key-rings, like the affirmations and coping skills, while task cards and icebreaker questions get clipped together using large binder clips. I love the binder clips because I can stand them up and place them on a shelf in a cabinet. The other storage containers I use all the time are these Iris boxes. They are 4" x 4" and are the perfect size for my I Know Card Games, which are the most popular games in my office. I also use a lot of Target Dollar Spot metal containers and jars. They hold pens, legos, fidgets, markers, and glass stones that I use as BINGO markers. I hope this gives you some ideas. I'd love to see your storage ideas. Please share them with me!